Larch casebearer defoliation visible from an aerial survey on June 7, 2017. Photo by Josh Haberstroh. Tamarack defoliation by larch casebearer is evident in northcentral and northeastern Wisconsin again in 2017. The most severe defoliation occurred in Lincoln and Langlade counties, while more moderate defoliation was noted in Waupaca, Shawano and Oneida counties. 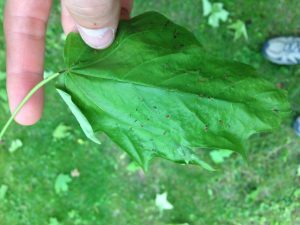 I saw extensive damage in northern Wisconsin by this insect in 2014 but damage was much more localized and less severe in 2015 and no damage was documented in 2016. Larch casebearer, Coleophora laricella, overwinters as young caterpillars and is able to start feeding as soon as the weather warms up in the spring. The caterpillars mine out the needles of tamarack causing them to turn brown by late spring. Tamarack trees will typically produce new needles after moderate or severe damage. Caterpillars pupate on the tree in early summer and moths mate and lay eggs in summer. A second round of feeding, which causes additional stress to the trees, occurs by young larvae in summer before they overwinter. Repeated defoliation can weaken the tree, making it more susceptible to mortality from eastern larch beetle. An annual or “Dog Day” cicada. 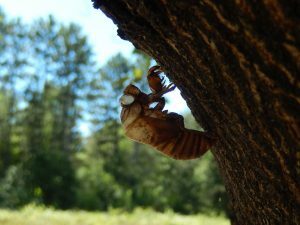 A recent article from Science Alert reported that some of the 17-year periodical cicadas associated with Brood X, have begun emerging – 4 years early! Brood X doesn’t typically emerge in Wisconsin, although it does emerge in some areas of Michigan and Illinois. 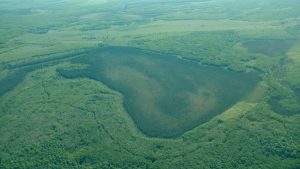 The brood that emerges in a few areas of Wisconsin is Brood XIII which isn’t due to emerge again until 2024. We also have annual or “Dog Day” cicadas that emerge every summer in Wisconsin. Cicadas are harmless, they do not bite or sting or attack people, they are not poisonous and don’t transmit disease, but they are big and the periodical cicadas emerge in huge numbers which can be quite upsetting to some people. The problem for trees comes when the females lay their eggs. They use a stout ovipositor to puncture the twigs of small trees and shrubs, laying an egg in the slit created by the ovipositor. This damage to the tree can cause twigs to die and break off. Some young trees can be badly damaged and may lose most of their twigs and branches, they may die or be severely stunted. An additional aggravation for many people is the very loud buzzing noise made by the males; some people refer to these insects as heat-bugs because their loud buzzing is often heard during the hottest days of the summer. 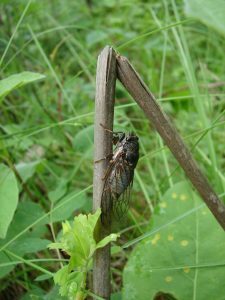 Cicadas emerge from the ground, climb an object, emerge from their exoskeleton, and leave the empty exoskeleton behind after they expand their wings and fly off. For more info on periodical cicadas check out the Cicada Mania webpage. White pine blister rust fruit body. White pine blister rust (Cronartium ribicola; WPBR), a naturalized pine rust disease, has been infecting white pine saplings in several northwest Wisconsin counties this spring. 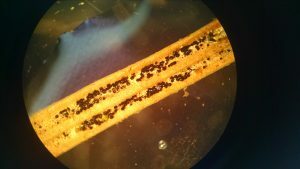 Although WPBR is common in the Lake States and can in some cases cause significant losses in white pine, taking several steps can help prevent infections before they start and manage them before damage occurs. Like many foliar diseases, WPBR infections are promoted by moist and cool spring weather that results in persistent wetness on foliage; specifically, at least 2 days of wetness while air temperatures are under 68oF. Maintaining dense stocking (6×6) reduces incidence of infection by increasing the mortality of lower branches, most susceptible to infection. Similarly, successive pruning of lower branches beginning at age 5 to a minimum branch height of 9 ft. prevents leaf contact with moist surface vegetation and can increase airflow, hastening foliar drying. If caught early enough, infections can be stopped before reaching the main stem by pruning out flagging twigs and branches to at least 4 inches past the interior-most wilting needles; if the main stem is closer than 4 inches from the interior-most canker or wilted foliage, unmanageable stem infection may already have occurred and the tree cannot be saved. 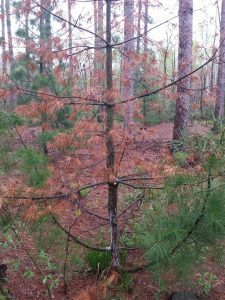 White pine sapling infected with blister rust. Photo by Kyle Young. Written by Paul Cigan, forest health specialist, Hayward (Paul.Cigan@Wisconsin.gov), 715-416-4920. Rhizosphaera needlecast of fir produces rows of round black fruiting bodies on the needles. Photo by Colton Meinecke. 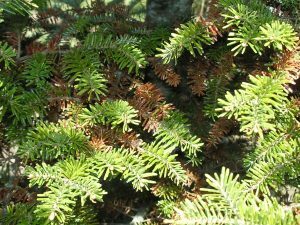 Rhizosphaera needlecast was found on balsam fir in Shawano County, with additional reports from Todd Lanigan (West Central WI) and Paul Cigan (Northwest WI). It causes chlorosis in the needles which drop off prematurely, giving the tree a thin appearance. This disease is related to the Rhizosphaera needlecast of spruce which you may be more familiar with. Literature indicates that it is most common on fir trees in shaded damp areas, or on trees that are under stress from other issues. 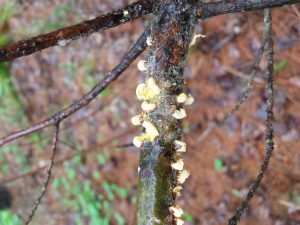 You will see small black fruiting bodies on the undersides of the needles, although what really stands out is the thin foliage or off-color needles compared to other unaffected trees. Needles from the previous year have turned brown and will drop off prematurely due to Rhizosphaera needlecast. Additional info can be found in this pest alert from the Forest Service. 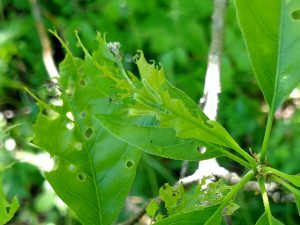 Spiny oak sawfly creates two types of defoliation. Young larvae chew holes in the leaves, and older larvae feed on leaf material between the veins. There are 3 sawflies near the center of this photo. Spiny oak sawflies are one of the many things that will feed on oak leaves. 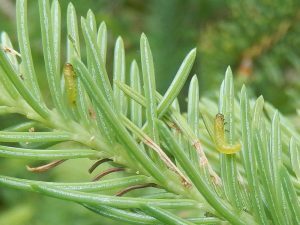 Sawflies look like caterpillars but they aren’t, so the caterpillar-specific pesticide, Bt, will not be effective on them. Spiny oak sawflies feed between the veins of the leaves, leaving a lacy appearance to the leaves. They have forked spines all along their bodies which turn black as they get older. I’m not aware of this ever being much of a real problem but at one site in Price County the damage to understory oaks was significant. Sapsuckers drill orderly holes through the bark into the cambium layer of the trees, causing them to bleed sap. Sapsuckers are birds that drill orderly holes through the bark of trees. The holes go just through the bark to the cambium layer, causing the tree to bleed. The sapsuckers then return to them later that day or the next day to feed on the sap. 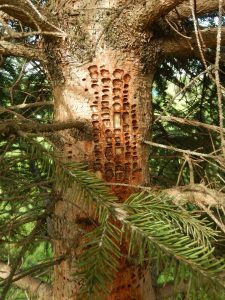 Sapsuckers are migratory and may just pass through an area in the spring, but they will sometimes return to the same tree over multiple years, creating new rows of holes each year. Trees will attempt to grow over this damage, and in most cases are successful. Occasionally the damage is so extensive that mortality can occur from that point up. Federal regulations don’t allow you to shoot sapsuckers, so control is usually some manner of deterrent, like wrapping the main stem with hardware cloth or burlap, or hanging scare tactics in the tree. Maple petiole borer damage close up. Photo by Kyle Young. Maple petiole borer has been active in the northwest. This exotic insect’s larvae cause tunneling damage to leaf petioles, leading to spring leaf drop in sugar maple. Oak leaftier, oak leafroller, and eastern oak looper. Oak leaftier rolls the leaf and secures it around itself with silk. Photo by Paul Veirauch. Localized oak defoliation near Pembine was the work of a combination of caterpillars. Oak leaftier, oak leafroller, and eastern oak looper were all found to be defoliating oak. 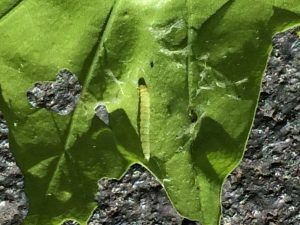 Oak leaftier and oak leafroller can cause similar symptoms since both caterpillars purposefully roll the leaf around themselves. This trait makes it difficult to spray for them since the chemicals can’t directly reach them. When defoliation is moderate, no control is necessary. 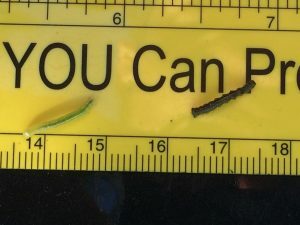 Oak leaftier and eastern oak looper on a ruler showing their size. Photo by Paul Veirauch. Giant hogweed. Photo by Donna Ellis. 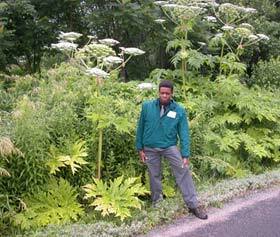 Giant hogweed can be a threat to human health. Its sap has Furocoumarins (photosensitizing compounds) that can cause a skin reaction known as phyto-photodermatitis. This makes the skin highly sensitive to ultraviolet light. Swelling and blistering of the skin may lead to permanent scarring, and contact with the eyes can cause temporary and sometimes permanent blindness.